Ross Brawn has powered many teams to numerous constructors' and drivers' titles, but taking the championship in 2009 with a car that bears his name must have been the sweetest of all. Brawn started his motorsport career in 1976 with Williams before joining March Engineering. Although originally employed as a machinist his talents were quickly recognised and he was moved to the F3 team as a race engineer. In 1978 he joined the newly formed Williams team, again as a machinist, and quickly graduated to the team's research and development department. After brief stints at Haas Lola and Arrows F1 he joined Jaguar to develop their sport car racing programme - his work on the Jaguar XJR-14 helped the team clinch the World Sports Car title in 1991. Later that year Brawn rejoined the F1 fraternity as Benetton's technical director. Under his direction the team won back-to-back drivers' titles with Michael Schumacher in 1994 and 1995 and the constructors' crown in 1995. Brawn earned himself a reputation of not only being a highly-skilled technician but also a master tactician. When Schumacher left for Ferrari in 1996, Brawn followed. He helped rebuild the struggling Italian squad and lead them to a string of six consecutive constructors' titles from 1999 onwards. In October 2006 Ferrari announced that Brawn would take a year's sabbatical in order to allow other members of the team to have room to develop, but he never returned. In November 2007 he was announced as team principal of the Honda F1 team where he remained until the manufacturer pulled out of the sport in 2008. An uncertain winter followed, not just for Brawn and his drivers Rubens Barrichello and Jenson Button, but also for the hundreds of employees at the team's Brackley base. 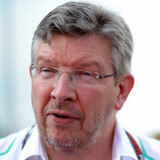 It is testament to Brawn's managerial skills that he managed to motivate his squad to continue developing the 2009 car when no-one could be sure they would even be at the first race of the season. In March 2009, just as the season was starting, Brawn completed the takeover of the team, securing Mercedes power, and Brawn GP was born. The faith and hard work of Brawn's boys was instantly rewarded when Button won six of the first seven races. After a tumultuous second half of the year, at the penultimate race in Brazil, Button became Britain's tenth world champion and Brawn GP took the constructors' crown. In doing so it achieved the seemingly impossible task of winning both titles in its first year of competition. On November 16, 2009 Brawn and his fellow shareholders sold a controlling interest in the team to Mercedes, securing its long-term future. Brawn then managed another mighty coup when he secured Schumacher as a driver for the 2010 season, bringing both experience and sponsorship to the team. However, the months of uncertainty and fighting for the title leading up to the announcements meant that the 2010 car had not received the resources it needed to be another winner. What's more, Schumacher struggled and in the end Mercedes relied on Nico Rosberg for the lion's share of its points. The following two years also proved to be a struggle and ahead of the 2012 Japanese Grand Prix Mercedes announced it would replace Schumacher with Lewis Hamilton. It was a huge signing for Brawn and helped him convince the Mercedes board to sign up to a new Concorde Agreement to keep the team in F1 until 2020. Now the team had its sights firmly set on the 2014 regulation changes, including the introduction of an all-new V6 turbo power unit. Brawn ensured chassis and engine departments worked in harmony, sewing the seeds for the birth of the championship-winning W05. But Brawn did not get to see the fruits of his labour hit the track from within the team as he was muscled out by the arrival of Toto Wolff and Paddy Lowe in senior management positions.